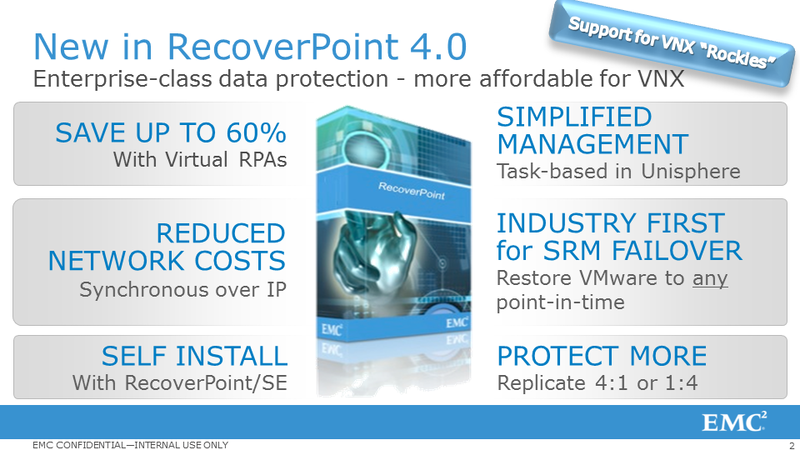 RecoverPoint is EMC’s continuous data protection and disaster recovery product offering . With RecoverPoint, you are able to journal every single write giving tremendous recoverability and flexibility in terms of RPOs. 2012 was a banner year for RecoverPoint. It became available as an offering across ALL of EMC’s block storage offerings (VMAX, VNX and VPLEX). It is, by all measures, a cornerstone of any data protection discussion. In Q2, RecoverPoint 4.0 became generally available. To date, we are seeing the fastest uptake of this release by customers. With this release, RecoverPoint has upped the ante with respect to protection offerings expanding its reach in both the mid-market as well as the high end of the market. Some of these have capabilities are truly pushing the envelope of what is possible and in more ways than one, a sign of what is coming down the road (HINT! HINT!). RecoverPoint works as a splitter that directs write I/Os to a RecoverPoint Appliance (RPA). 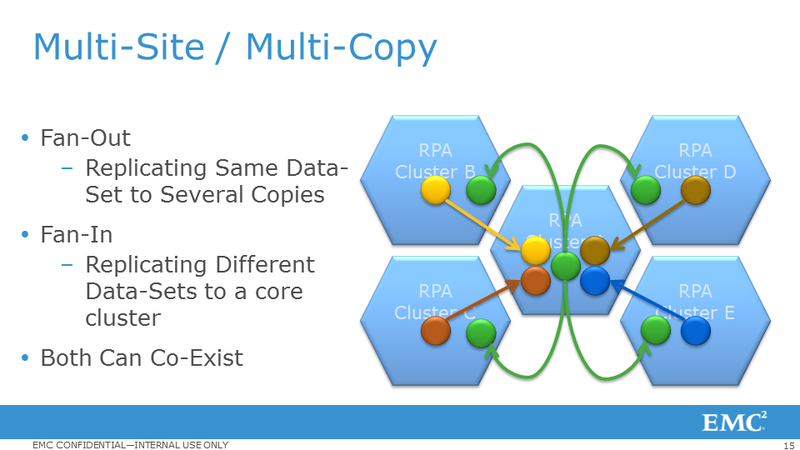 The RPA is then responsible for cross site replication. One of the major asks from customers has been to allow them the flexibility to deploy the RecoverPoint Appliances as a virtual machine. Well, your wish is our command. With RecoverPoint 4.0, we have done exactly that. The RPA is now offered as a virtual appliance (vRPA) that YOU can choose how and where you need to deploy. To make matters more interesting, the cost of the vRPA is … WAIT FOR IT … ZERO!! Let me repeat it – you can download the vRPA free of charge! The availability of the vRPA implies that the RecoverPoint appliance becomes hardware independent. For VNX environments, this can mean a savings of up to 60%. Scalability in terms of vRPAs is as simple as deploying a new vRPA VM. 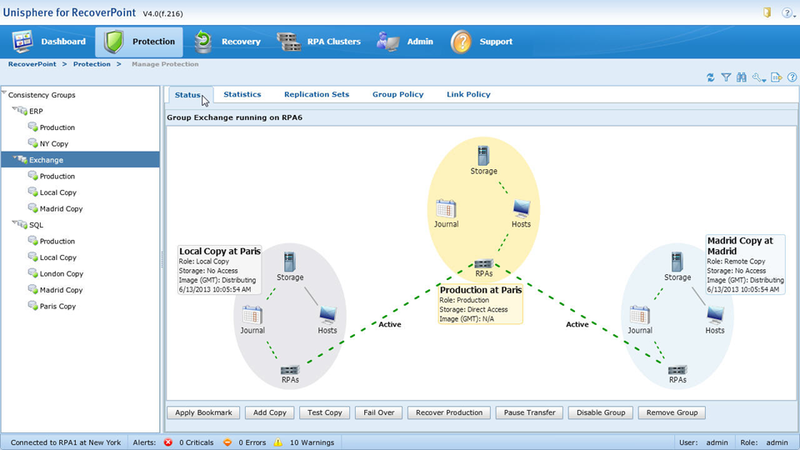 vRPA can connect to not only to other vRPAs on the second site but also to physical RPAs. 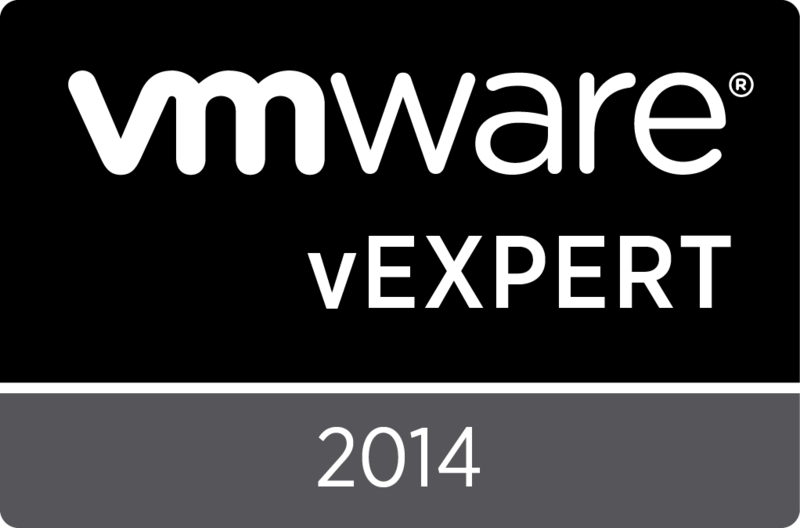 The initial release supports VNX only. 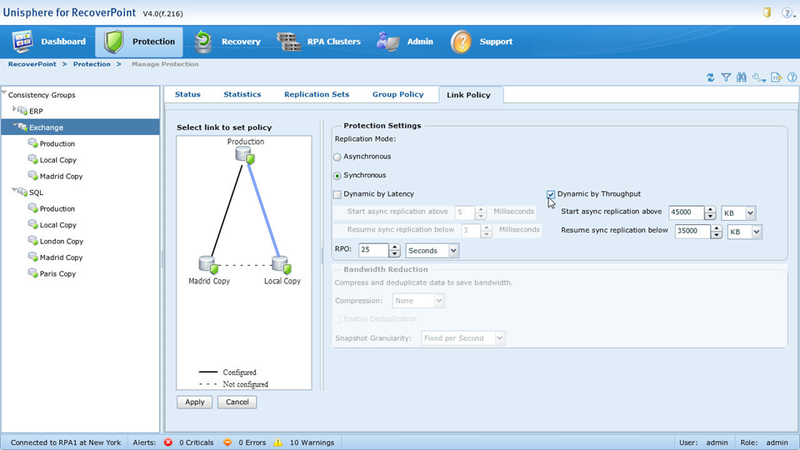 The host to VNX protocol can be FC or iSCSI but the protocol between the VNX and the vRPA is iSCSI. vRPA will have a different performance profile compared to the physical. 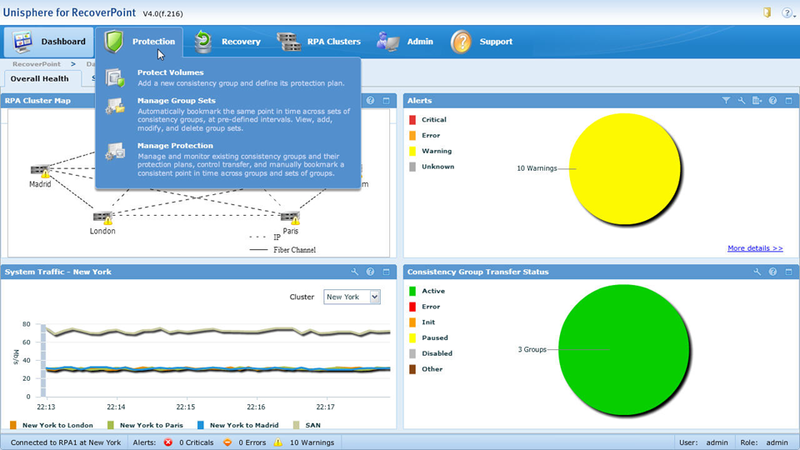 Always use EMC sizing tools to determine what performance and sizing you would need to use. 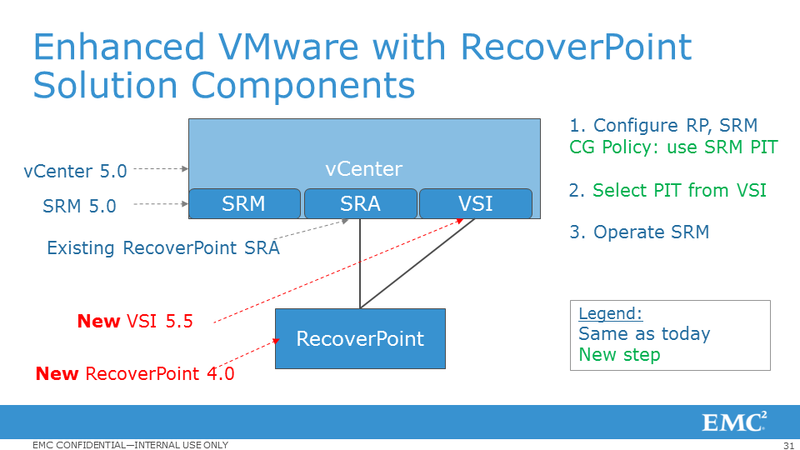 Continuing on the *virtual* theme, one of the major deployment scenarios where we see RecoverPoint is with VMware Site Recovery Manager (SRM). 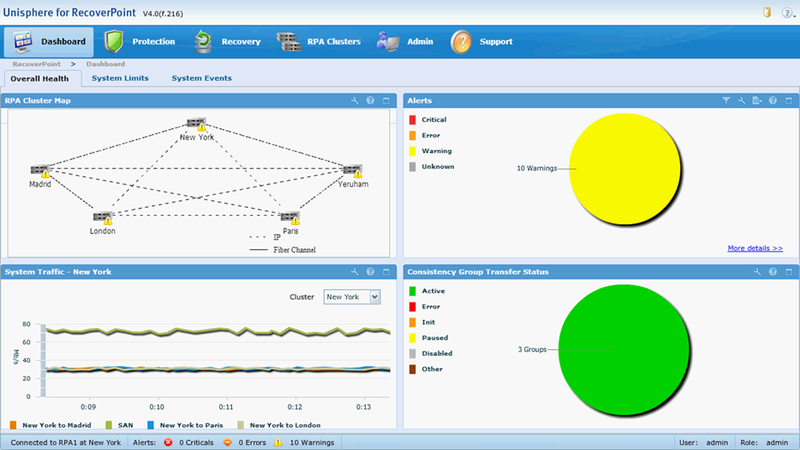 SRM is used to orchestrate VM Recovery and to test Disaster Recovery. However, one of the issues with this deployment has been that SRM only allowed recovery to the last point-in-time. This took away one of the core advantages that RecoverPoint normally provides (ability to recover to any point in time). This gets addressed with RecoverPoint 4.0. 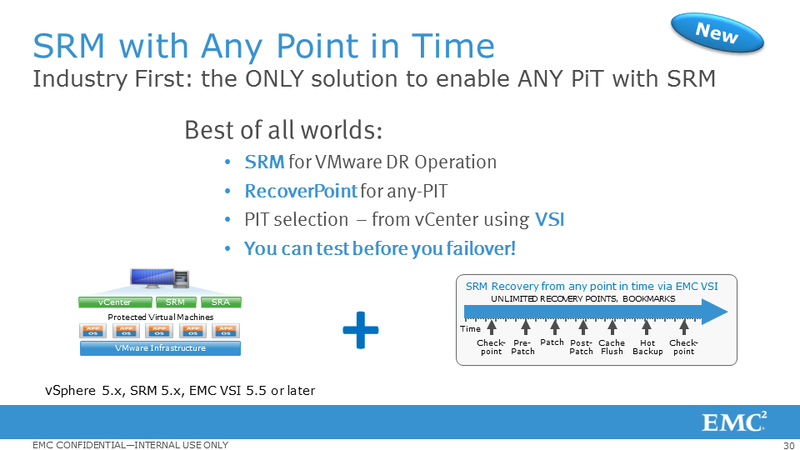 Combined with the EMC Virtual Storage Integrator (VSI) which is a free plug-in from EMC, you can now select the point-in-time to which SRM failover can recover to. 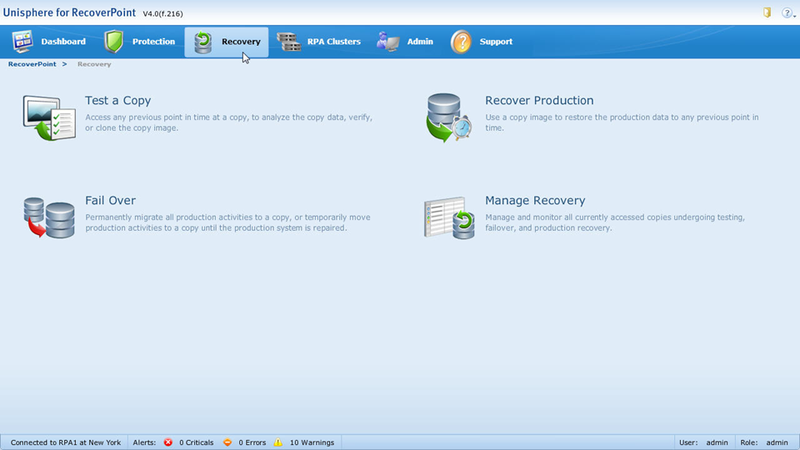 The RecoverPoint DVR capabilities are now available through Site Recovery Manager (SRM). Another pretty exciting industry first to a very strong use-case. RecoverPoint 4.0 adds a completely new chapter to the replication story. 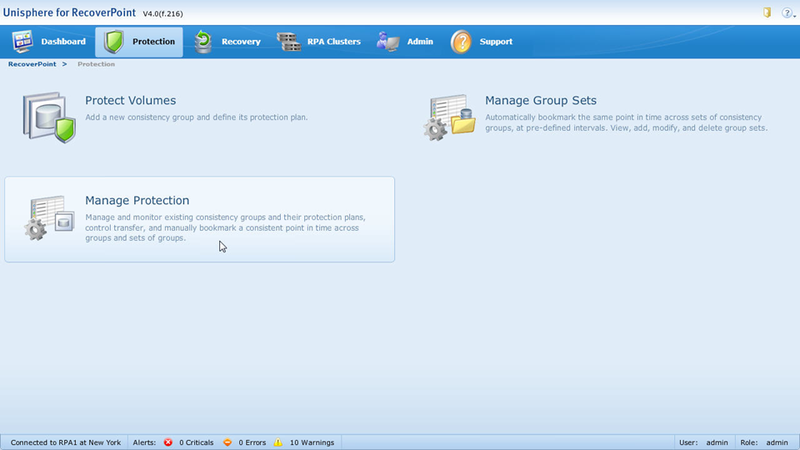 The solution now introduces the ability for multi-site protection. 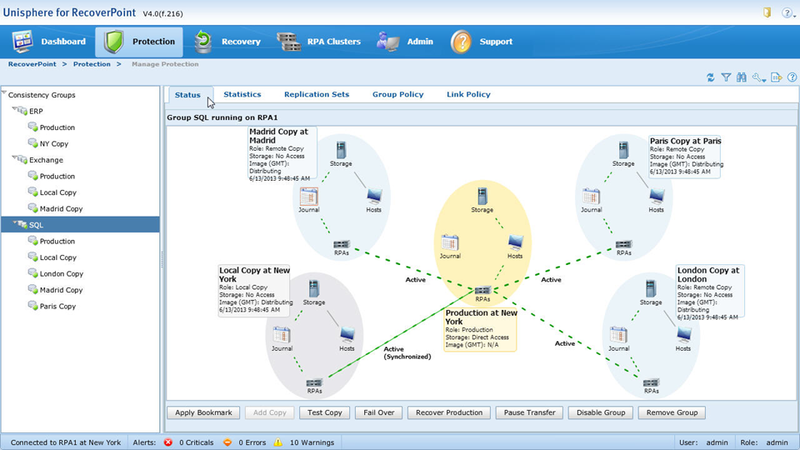 This allows the solution flexibility to create multiple system and replication topologies. The maximum supported Fan In and Fan out Ratio is 4:1 (i.e. you can have a single RecoverPoint Appliance connect to up to 4 other RecoverPoint Appliances). As I am sure you want to understand, what use-cases does this help address? Imagine you are a business with multiple data centers and need to protect your data at a centralized data center. Well with the fan-in capability of RP, you now have that flexibility. Or you are a service provider and you need multiple customers to connect to your site so as to be able to offer your customers off-premise disaster protection. You can also have replication go the other way. If you need multiple copies of your data protected in different locations, that is where the fan out portion of RP comes in. Or you need to protect different consistency groups in different locations. Combine this capability with the vRPA and you start to see the Disaster-Recovery-as-a-Service use-case start to emerge from the haze. For those following the EMC portfolio, getting to a point of common look / feel and workflow has been something that we have been diligently working at. 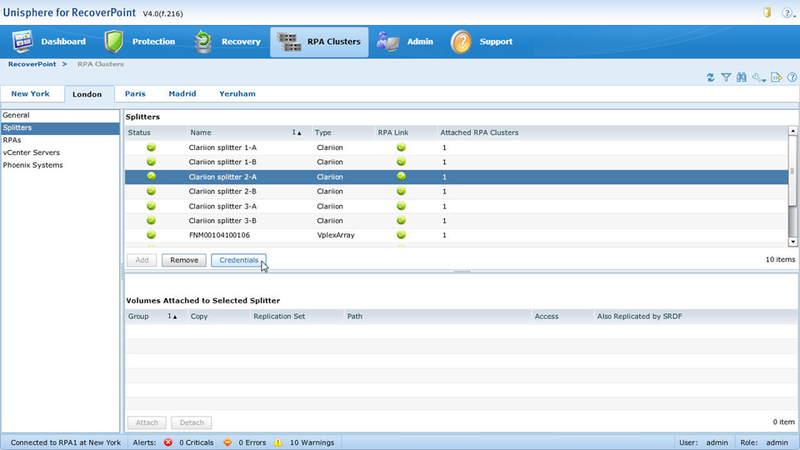 Last year, we introduced the Unisphere GUI on VPLEX and VMAX to join the VNX family. 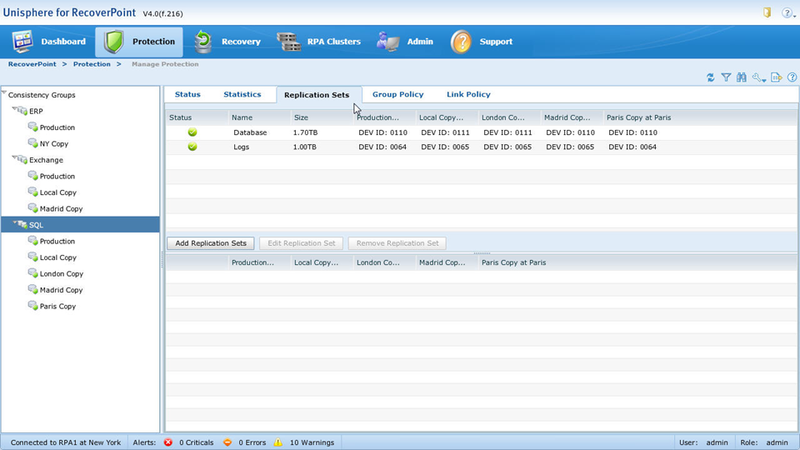 With the 4.0 release, RecoverPoint gets the Unisphere GUI as well. Deeper information than ever before making it invaluable in trouble shooting. Here are some screenshots from the new GUI. My hat is off to the RP team – each of the above are major capabilities on their own. To deliver all of these within one release across multiple platforms is an engineering feat to marvel at. But more importantly, this is tremendous value delivered to our customers. If you are a RecoverPoint customer, first off thanks! But second of all, have you upgraded to RP 4.0? What has your experience been so far? What do you think of these capabilities? Do let us know!